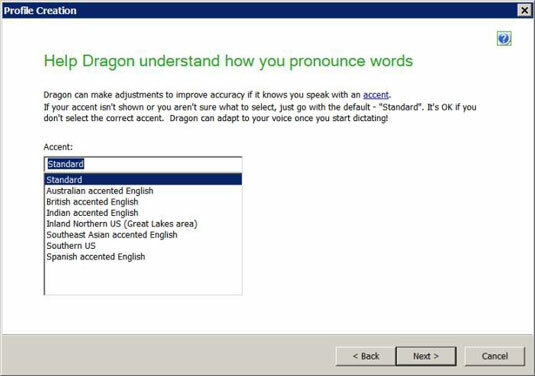 Automatically, the first time you run NaturallySpeaking after installation, click the Dragon icon on your desktop (or on the Start screen in Windows 8). You can also set up a new user profile manually by going to the DragonBar and choosing Profile→New User Profile and then clicking the New button in the New User Profile window. The wizard opens. 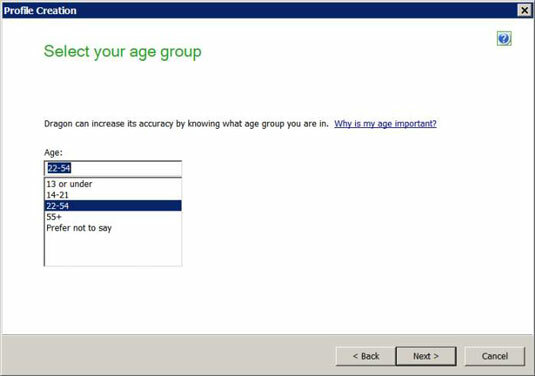 1Click Next on the Creating a User Profile screen. Your User Profile name: This name will appear on future lists and menus so that you can tell NaturallySpeaking which user you are. So pick a name you will recognize as your own. Type it into the text box in the center of the screen and click Next. Your username is case sensitive. Be aware of that when you make a choice. If you type your name as Tom with a capital T, you won’t be able to use tom later. Your age group: The wizard isn’t just being nosy. Age plays a part in how your voice sounds. No one is looking. Make your choice from the drop-down list. Click Next. Identification of the words you say: It’s important for NaturallySpeaking to prepare files that are specific to your region of the world. Again, choose from the list. Click Next. The way you pronounce your words: There are identifiable accents depending on where in the world you first learned to speak. It’s important for NaturallySpeaking to prepare files that are specific to your region of the world. Choose an accent from the list and click Next. How you talk to your computer: You need to identify whether you’re going to speak directly into a microphone or use a recorder. You have a choice of Mic-In Jack, USB, Dragon Remote Microphone Application, or Line-In Jack. If you want to use the headset that came with NaturallySpeaking, choose Mic-In Jack. For now, to make it easy, unless you are sure about your recorder, just choose your microphone. 2Click Next. A screen with all your choices appears. If you agree with them, click the Create button. NaturallySpeaking creates your profile. You will see the progress on the screen, and then your user profile is created. You’re automatically taken to the next screen, which helps you properly position your microphone. This is an instructional screen that requires no information from you. It just gives you advice on how to position your microphone, and it shows a picture illustrating the approved technique. 3Position the microphone as directed. The main idea is that the microphone needs to be near your mouth, but not in front of it. (In front seems natural, but you get interference from your breathing on the microphone.) It should be far enough to the side that you don’t bump it with your mouth when you talk. You may need to twist the arm a bit to get the microphone positioned just right. Put the microphone a distance of two fingers from your mouth; that’s the perfect amount of space. Also, make sure the word talk under the boom cushion is pointing toward your mouth; otherwise, you will not be heard. 4When your microphone is properly positioned, click Next. It’s time to adjust the volume with the Adjust Your Volume screen. 5Click the Start Volume Check button and read the text aloud at the volume you plan to use when you dictate. Stop talking when you hear the beep. The important thing is to keep talking until the wizard is done adjusting the volume. 6Click Next to move on to the Test the Quality of Your Sound System screen. This screen is another where you talk to the computer while it analyzes. Earlier, it was only listening to the volume. Now it’s analyzing your voice. 7When you’re ready, click the Start Quality Check button and start talking. Read the text provided on the screen. You should get a Check Microphone: Passed alert. 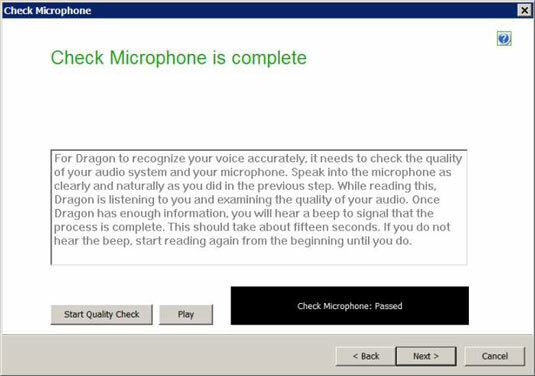 If the test fails, try repositioning your microphone and clicking Start Quality Check to run the test again. You can run it as many times as necessary. If you continue to fail this test, you may have a broken headset or the sound card on your computer may not be sufficient. To fix this issue, get a USB adapter for your headset or a new USB headset. The USB adapters or headsets have their own sound card that bypasses the one not working in your computer. 8When you’re done with the quality check, click Next. You’re presented with the Read Text Aloud message to train Dragon. If you want to stop at this point, click Cancel and exit NaturallySpeaking. 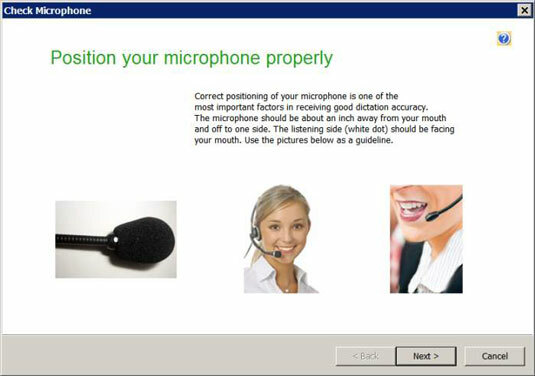 NaturallySpeaking remembers that you made it through Audio Setup and starts you off reading training text.